Lord Stirling Stable offers a full complement of riding activities for riders of most ages and abilities. The stable is located at 256 South Maple Avenue in Basking Ridge, and the office is open daily from 9am to 5pm or may be reached by calling 908 722-1200, ext. 5010. All riders are required to wear an ASTM/SEI approved equestrian helmet and shoes or boots with a smooth, hard sole and a moderate and definite heel. Helmets and boots may be rented for $4 each. Somerset County residents are required to show proof of residency. All riders must be at least 9 years of age and activity-based weight limits apply to riding programs. For additional information, please visit our website at www.somersetcountyparks.org. 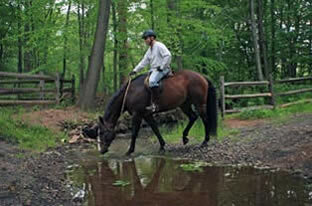 Introductory Rides are offered to people who are new to horseback riding or have never ridden English. Rides will be held on June 2, July 14, August 18, and September 29, 2019. In addition, special Western Introductory Rides will be available on June 30, August 4, September 15, October 13, and October 27. Please call the Stable office for ride times. Each ride begins with a brief lesson followed by a one hour trail ride led by one of our certified Instructors. Participants between the ages of 9 and 12 years must be accompanied by a parent or legal guardian and all riders must weigh less than 200 pounds. Registration is open and available online for all scheduled Introductory Rides. The enrollment period closes when an individual ride is full OR on the Thursday before each ride. The fee is $40 for Somerset County residents and $50 for non-residents. 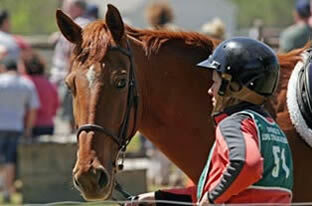 Approved equestrian helmets and boots are required and included in the program fee. NEW this year, call to reserve a horse for a one-hour trail ride designed for people with little or no riding experience. The ride will always be conducted to match the skill and comfort level of the least experienced participant. Reservations will be available for hourly time slots beginning at 10am daily, with the last ride leaving the courtyard at 6pm. Guided trail rides will run through November 30 as weather permits. Call at least two hours before your desired time to book your ride for 2 - 4 people. All participants must be at least 9 years of age and weigh no more than 200 lbs. The fee is $40 per person for Somerset County residents and $50 for those who live out-of-county. If your party takes all four spots on a ride, you will receive a $5 per person discount. Payment is required at the time of reservation. A limited number of opportunities are available daily, so please call 908 722-1200, ext. 5010 as far ahead as possible to avoid disappointment! Lead Line is the perfect way to introduce children to riding. Ponies or small gentle horses are rented by the half hour. The child must be old enough to sit up and hold onto the saddle without assistance. A stableworker demonstrates proper leading procedure before handing the pony or small horse to the parent or legal guardian, who will then lead the pony/horse while their child rides. Use of an approved riding helmet is required. Small size helmets are provided free of charge. Lead Line is available daily; please call 908 722-1200, ext. 5010 for hours. The cost is $11 weekdays and $12 on weekends for Somerset County residents and $13 weekdays and $14 on weekends for out-of-county residents. Books of ten rides and gift certificates are available. An unforgettable way to celebrate a birthday or other special occasion is unbelievably simple with a Lord Stirling Stable Pony Party! Our two-hour package includes the use of two ponies for the first 45 minutes, plus a staff member to provide, supervise, and remove the ponies at the appropriate times. Adults from the party lead the ponies. Guests spend the remaining time in the climate-controlled party room, where three tables and 30 chairs are provided for your use. The fee is $175 for Somerset County residents and $250 for non-residents, and includes up to 12 children. Additional guests may attend for an additional fee per person ($5/resident, $7.50/non-resident). There is a maximum of 25 children allowed. Horseshoes and other children's games are available to rent for $10 each. Call 908 722-1200, ext. 5010 for information about our special "Happy Trails Birthday Package". Call or stop by the stable at least two weeks prior to the desired date to make your reservation! Pony Parties are available seven days a week. There is a maximum of 30 people (adults and children combined) allowed in the party room. English style riding lessons are offered from beginner through advanced levels for juniors and adults. Trail, jumping, and various specialized flat classes are also offered. Sixty minute lessons are offered once a week for 10 consecutive weeks. Juniors also have the option of riding twice a week for five weeks, and adults may choose to register for a special five week session. Summer camps and Horse Care Workshops are available, as well. Lessons begin Monday, June 17 and end Thursday, August 29, 2019. Program registration begins at 8am on Saturday, June 1 online and in the Stable office, where walk-in registrations will be accepted until 3:30pm. Online registrations will continue to be accepted, space permitting, through 11:59pm on Monday, June 3. Registration after that date must be done by telephone or in person in the Stable office. Riders who wish to pay by cash or check or who are enrolling for the very first time are required to register in person. Out-of-county residents have the option of purchasing a Non-County I.D. Card for $170 at the stable office. Each Non-County I.D. Card entitles one person to discounted lesson fees for one year. Equine-themed camps for junior riders (ages 9-17) are conducted from 8:30am until 1:30pm, Monday through Friday. 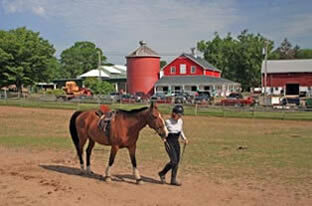 Camps includes a daily one hour riding lesson and hands-on learning experiences. Each weekly session has a different theme and is open to riders at and above the D-3 level; riders at the D-1 and D-2 levels are eligible for special sessions. Dates and times vary; please see the website (www.somersetcountyparks.org) for details. Enrollment began in March and will remain open until sessions are full or until the Friday preceding the scheduled camp. Riders who can post the trot and are secure and comfortable at the canter in an English saddle may rent horses for an hour's ride in our large indoor ring, two outdoor rings, or 18 miles of well-maintained trails. Riders must be at least 9 years old (12 years old for trail riding) and weigh less than 200 pounds. Trailguides are available on Sundays through June; thereafter, they will also be available on weekdays at 2pm and on Saturday afternoons throughout the summer. Groups depart every hour with a minimum of two people. For an annual fee, people who have their own horses may enjoy the trails or outdoor rings as weather and ground conditions allow. The Trail Permit cost is $20 per calendar year for Somerset County residents and $30 for non-residents. Single day passes are available for a fee of $10 for Somerset County residents and $15 for non-residents. The spacious indoor ring may also be used for $15 per hour. A current negative Coggins taken within the last 12 months is required. Lord Stirling Stable has unique program options available for your group. Whether you are looking for a team-building exercise with a difference, or just want to try something out of the ordinary with friends, we have an opportunity for you. Savor some of the 18 miles of beautiful equestrian-use trails from the back of a horse or from our tractor-pulled hay wagon. No 'horse experience' is required! Group rides for adults and youth include a brief lesson with a certified instructor who will then guide your one-hour trail ride. Guided rides are available on Sundays and weekday afternoons. The flat rate for 10 riders or fewer is $380 ($350 for youth under the age of 18). Individuals must weigh less than 200 pounds to participate in this program. Please call the office for date availability and reservations. Tractor-pulled hayrides are an excellent choice for those who would love a trail experience but are not sure about riding a horse. They are also an option if your group is very large (up to 30 people) or if there is a broad age range to accommodate. A flat rate of $100 covers up to 10 people; additional participants may attend for $10 each. By horse or by wagon, the trails of Lord Stirling Stable are definitely worth a visit. Call 908 722-1200, ext. 5528 today to book your group's special trail experience! Revised and expanded Horse Care Workshops are offered for individuals seeking competence and confidence around horses through a combination of non-riding activities and hands-on experience. Classes will take place on five consecutive Saturdays. The basics of horse care will be covered in Horse Care Workshop 101 from June 22 through July 20, 2019. Horse Care Workshops 102 and 103 will begin on July 27 and finish on August 24, 2019. Horse Care Workshop 102, meeting from 10:00am – noon, expands on the basic topics of Workshop 101 and introduces subjects such as tack selection and fit, hoof care, and basic feeding. Horse Care Workshop 103 builds on topics covered in Workshop 102. Conformation and selection, advanced nutrition, and basic first aid will be among the subjects discussed in this class, which will meet from 1pm - 3pm. These advanced workshops may be taken concurrently. There is no riding involved in the Horse Care Workshops. The cost is $60 for Somerset County residents and $90 for non-residents. Online and in-person registrations will be accepted up until the first day of class as space permits. Each spring, the public is invited to watch Junior Lord Stirling Stable students compete in a horse show and display their skills. This year's show is being held on June 9 beginning at 8:30am. Classes vary from first time riders who have completed 10 lessons to advanced classes over fences. There will be a performance by the Junior Drill Team at 1pm. Scouts ages 9 and older will learn skills to help them earn horse-related badges, where available, or just have fun learning about horses. Topics include safety in the barn and around horses; an introduction to breeds, colors, and parts of the horse; and the important roles of the veterinarian, the farrier, and the equine dentist. Each scout will have the opportunity to gain hands-on experience learning to groom a horse. The fee for this program is $12 per scout for troops in Somerset County and $15 per scout for out-of-county troops. Minimum group size is 6 with a maximum of 12 participants. Leaders and chaperones attend free of charge. NEW this year, scouts may opt for one hour of hands-on grooming and horse care instruction and a one hour introductory riding lesson. Please contact the Stable office for fee information. For more information and to reserve a time, contact the Stable at 908 722-1200, ext. 5528. The Friends of Lord Stirling Stable (FLSS) is a 501(c)(3) organization that supports the equestrian activities of the Somerset County Park Commission Lord Stirling Stable. By contributing their ideas, volunteering their time, and donating revenue generated from sponsoring events, the Friends help provide a continuous and expanding program of activities. Additional information about the Friends and these events is available on the internet at www.flss.org. Registration for FLSS events is not currently available online. These rides are the perfect opportunity for non-equestrian family members to join "the rider in the family" on a leisurely and relaxing trail ride at a walk. Mother's Day is May 12 and Father's Day is June 16. Each ride will be conducted from 10:30am – 11:30am; please check-in at 10am. Pre-registration is necessary; forms are available on the FLSS website and in the Stable office. The public is invited to cheer for Lord Stirling Stable adult students as they compete in the annual Spring Horse Show on June 8 beginning at 8:30am. The Adult Drill Team will perform at 1pm. Come watch our students of all riding levels show off! Dog Walks are available every Saturday. Summer check-in time (May 25 through August 24) is 9:15am, with the walk from 9:30am - 10:30am. Winter hours remain in effect through May 18; check-in is 10:15am and the walk commences at 10:30am. For more information, please contact Martha at 973 635-8672 or by e-mail at pandmwells@gmail.com. For directions, please call the Stable. E-mail Lord Stirling Stable with any questions or comments.